During May 2003 I paid a visit to my family and friends in Taunton. I took a few photos, so here they are. I also visited (but did not photograph) The Anchor, Hillfarrance; The Victory, Allerford; The Lamb and Flag, Blagdon; The Queens Arms, Pittminster; and Brazz, Taunton. Of all of these pubs, the Lamb and Flag is the nicest and most "local pub" type, and the Queens Arms is full of comedy parody type characters. The Parade, Taunton. 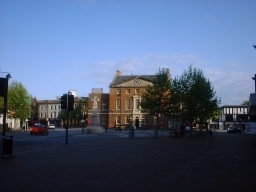 This is now a roundabout around the war memorial (the stone cross thing) and outside The Market House (the big building. It's a pub, but a bit of a meat market - hence the name?) which is all cobbled and unfriendly to traffic. Unfortunately this is the centre of town, there is no bypass, and Taunton has nowhere else for traffic to go. 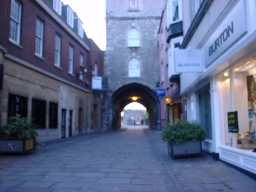 Castle Bow - looking through the portcullis by the entrance to Brazz, through to the battlements on the top of The Winchester Arms. Yes, Taunton is old, pretty, and full of pubs. Nothing else though. We went to a substation so I could photograph pylons. Here's one photo. 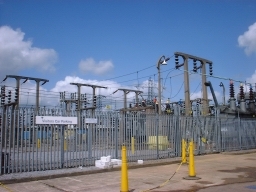 Won't bore you with the rest - if you want them, see my pylons site. 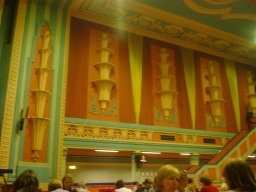 It's held in an old theatre hall, which has been converted quite well and retains the original (very gaudy!) decor. Please note that not everyone in attendance is old. 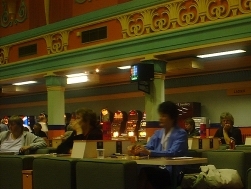 The room is dotted with fruit machines, to fleece you for more cash. 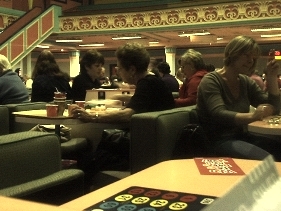 They also play "line games" on boards built into the tables, in between "real" games. 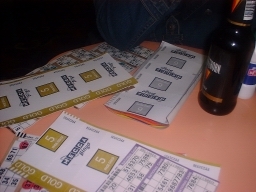 The numbers which were called are shown on this board, along with the type of game being played and the amount of money for winning. However I could only photograph the board when I wasn't busy playing so it's not lit! 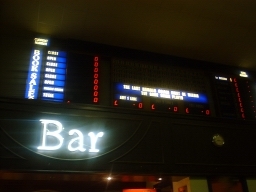 Also there is a (cheap) bar, and (horrid) food counter. Here are the books you play with. You have to listen for which book is in play, and then which page (the yellow page in the bronze book, etc.) Then you have to get the line, two lines or full house on the same ticket on that page. There are six tickets to a page, so every single number is on the page somewhere. If you win you shout out. According to the leaflet you can shout anything you like. It's probably as well I haven't won yet. 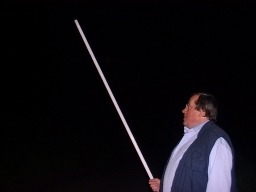 We also investigated a phenomenon where, when you stand under electricity lines holding a fluorescent tube, the electromagnetic current induces the tube to glow in your hand. We did this right by the substation, where you can hear the wires crackling 24/7 as it is. And here's the glowing tube. 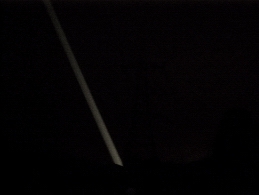 It was actually a lot more impressive, but my camera doesn't pick it up well in the dark. A real light sabre moment! I slept on a mattress on top of a desk in the garage. 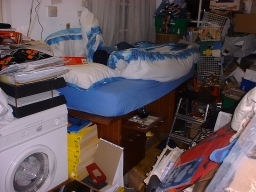 The washing machine beeped several times every minute when it finished a cycle, and I needed steps to mount the bed. Apart from that it was reasonably comfortable. 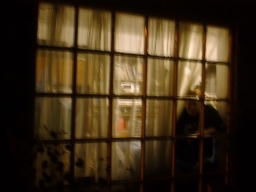 My bed was on the other side of an outside window, for that "Amsterdam" feel... Wonder what the neighbours thought?